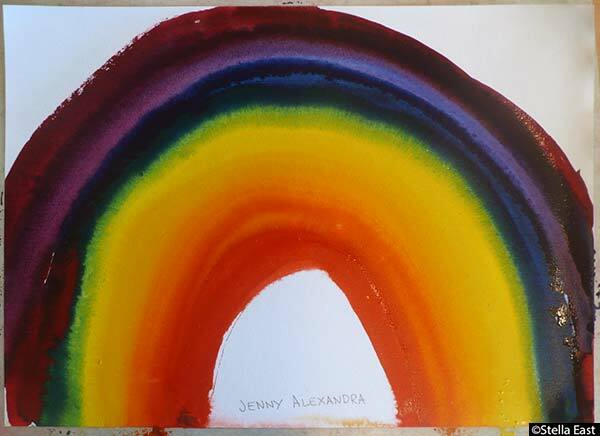 When I began with my combined exhibition/presentation/rainbow workshop in 2006, it was hard to imagine how I could possibly organize, – let alone clean up for 20 – 30 children. Though teachers often help with the cleaning, they also “have to go” to other things. Helpers from the 9th or 10th grades also “have to go”, – to guitar lessons or homework-help. 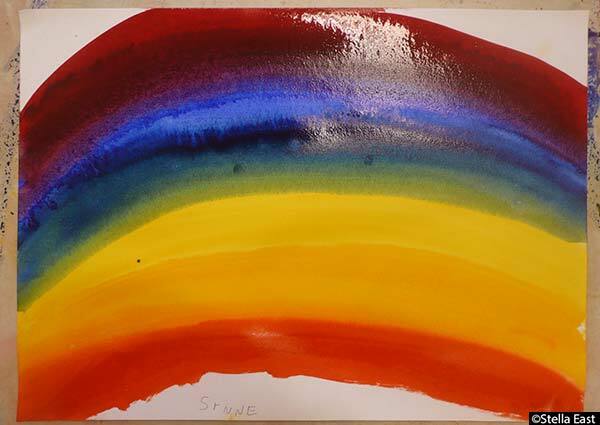 I don’t remember when it started, but I began getting help from the 1st – 4th graders, the same children who had painted, or who will be painting rainbows. With their help, cleaning-up literally becomes a game. 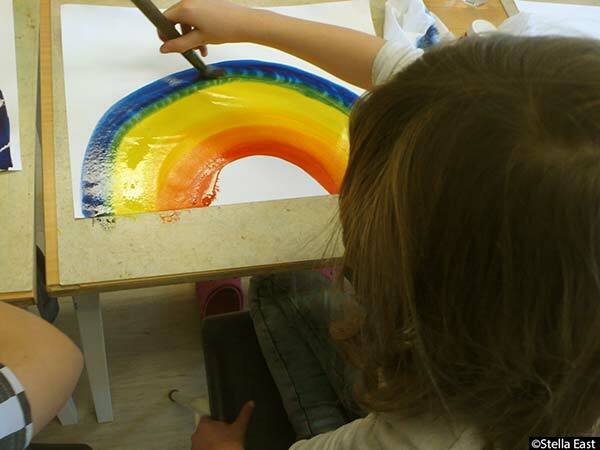 Cleaning up after the Rainbow Workshop at Torpa School, Oppland County. I metaphorically call it “dishwashing” after messy “dinner guests” and when everything is sparkling clean, we “lay the tables” anew for the next guests. 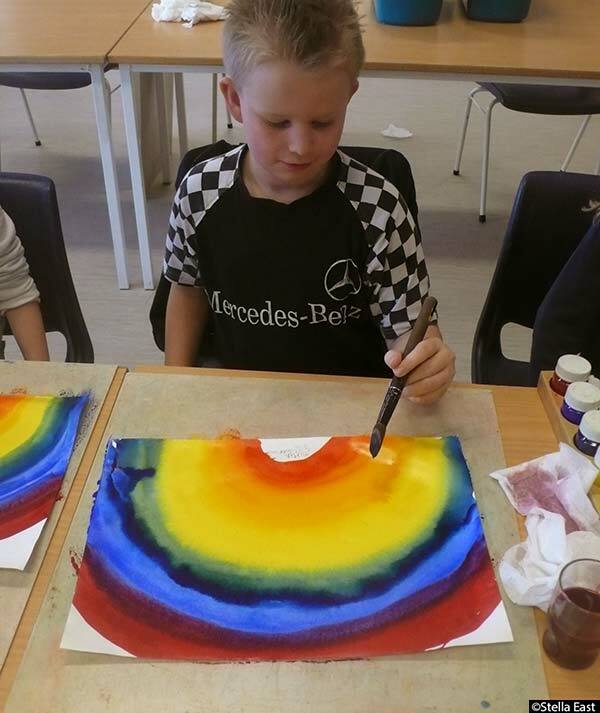 And what a unique experience these helpers get, – seeing the black, brown, orange or purple washing-water mix and dilute at it swirls down the drain, or seeing colourful modern-art-like-patterns on used paper-towels, before throwing them away, or “drowning” sheets of watercolour-paper up in a tub of cold water. And then there is that inviting “feeling” from clean soft paint-brushes and neat rows of brightly coloured jars of paints. In fact some children never want to leave, even after a job is done. They stay to play on the mats in front of the paintings, look in the picturebooks, or count the jars of paints. That inviting “feeling”: Jars of paints, washing-cloths, soap, and buckets from my travelling Workshop at Dokka School. Oppland County. Though some may think that 1st – 4th graders are too young, some children have exclaimed that the cleaning up was the most fun about the whole workshop. I have experienced children appearing with false notes, – stating that he or she, the child-with-the-note, was allowed to come and help me, even though other children had been elected. Washing-cloths hanging to dry in my travelling Rainbow Workshop outside Fryal School, Oppland County. The last two days of my tour is at Torpa School. The GPS insists on taking a less direct route than the one I had seen on Google maps. The winding roads are slippery and snowy with beautiful views looking over valleys covered with snow-laden trees. I arrive at 7:50am as daylight begins. The principle helps me carry in the equipment and arrange the furniture. The orderly Arts and Crafts room expresses an appreciation for arts and crafts. A boy and a girl from the 3rd grade help “lay the tables”. When they are finished they stay and play until their class arrives. The Arts and Crafts teacher joins in “just to watch, and listen,” she says, – but she also helps out, even though she doesn’t work that day. A group of nineteen 3rd graders attend in the morning and twenty-four 2nd graders have their turn in the afternoon. Some of the children have to take a bus at 1pm. We put those children all at one table so they will get extra help finishing in time. Some second graders who do not need a bus, stay behind to clean up. On my second day at Torpa School I plan my route according to Google maps. When I finally find the turn off road, I discover it has not been ploughed! I turn around and put my trust in the GPS. 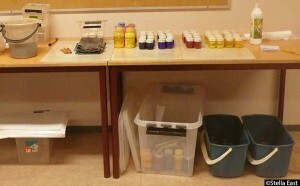 Luckily all the tables, paints, and paper had been prepared the day-before. I call ahead to say I got lost but I am almost there. The school puts the last details in order and I am ready on time when the twenty-five 1st graders enter the room. In the afternoon the 4th graders finish 10 minutes early. “A new record”, I say. “A record!” exclaims a girl! “Yeah!” The Arts and Crafts teacher makes a pallet from my paints for further discussions with the children about colour. I take photos of the rainbows. We move the rainbows into the Arts and Crafts storage room where they won’t be disturbed. 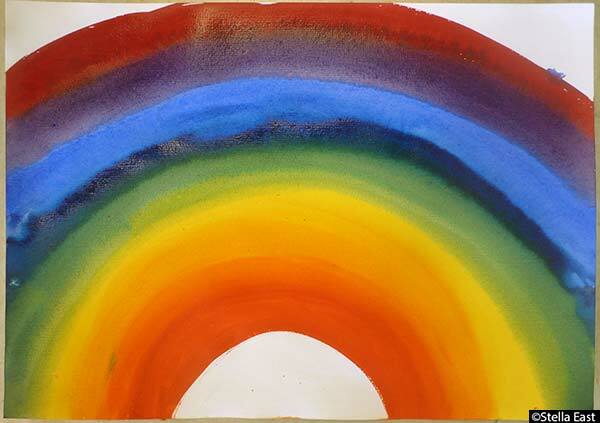 At one point we have trouble seeing the difference between the 1st grader’s rainbows and the other rainbows. We laugh about this, as some people claim this exercise is too difficult for 1st graders. The friendly janitor carries the paints, boards, etc. to the door and the principle comes to say good-bye. I began this tour at Vestsida and end at Torpa, – a wonderful start and a wonderful ending. Painting the colour green at Torpa School. Photo: Mari Bakke. 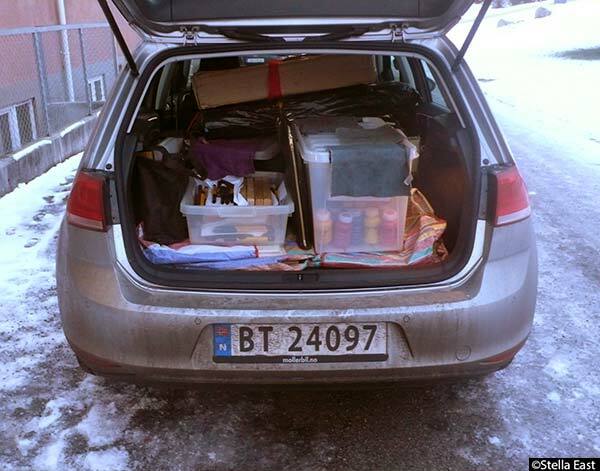 I drive home to Oslo on the other side of the Mjøsa Lake. A deer springs across my path. The highway after Hamar is 110 kmt and the winds are strong, shaking the car and my nerves. A kind neighbour helps me get all my equipment indoors. I return the rent-a-car, and take a tram home. I store all the paint remains in a few clean paint-jars. The remaining jars and lids with leftover paint are put into a bucket to soak, the well-used washing-cloths into the washing machine and the water glasses into the dishwasher. My tour for 2015 is now finished. I love touring schools and sharing art with children. A rainbow at Fryal School. Categories: Teaching and Workshops, Picturebooks, and Art in Public and Private Spaces. 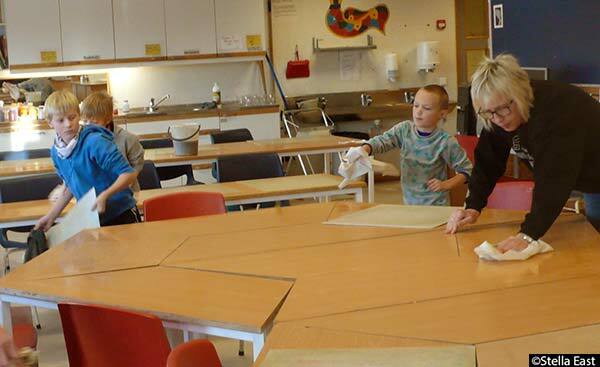 Tags: Den kulturelle skolesekken, The Paint Box, The Cultural Rucksack Oppland, DKS, and painting workshop. All Rights Reserved. This material is protected by copyright law.